Flynn “didn’t have the opportunity to sign it,” said Price Floyd, a spokesman for the retired Army general. “But he is going to abide by the pledge” and has not engaged in any lobbying work since leaving the White House that would have violated the pledge, Floyd said. Trump signed an executive order on Jan. 28 prohibiting political appointees from lobbying the government in any way for five years after serving in his administration. That same order instituted a lifetime ban on outgoing officials representing foreign governments. Flynn was fired on Feb. 13. At the time, the White House said he was ousted for failing to fully disclose to the vice president and others the nature of his conversations with the Russian ambassador to the U.S. 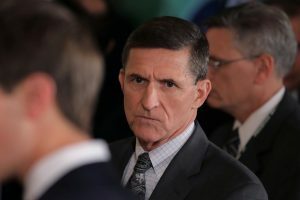 Since his departure, Flynn registered with the Justice Department as a foreign agent, acknowledging that he had lobbied for a Turkish businessman, performing work that could be viewed as benefiting a foreign government, before going to work in the White House. Flynn’s lawyer says the Trump transition team and the Trump White House were aware of Flynn’s lobbying. The White House has said it did not know or ask for details on the nature of the work. White House spokeswoman Stephanie Grisham said Wednesday that “all applicable employees have signed the ethics pledge.” She did not answer questions about why Flynn had not. The White House did not immediately respond to a request to review those documents. Left: White House National Security Advisor Michael Flynn (C) arrives at a news conference Feb. 13 in Washington, D.C. Photo by REUTERS/Carlos Barria.